The southern coast which in recent times has witnessed a flurry of development and related activities, will soon be home to an idyllic, luxurious yet at the same time, a home away from home development; Tamba Villas. “To build a home that is so exceptional that coming home either for a holiday, or to live there permanently would be the ultimate in paradise living!This is Eduard Hempel’s vision for his latest venture, Tamba Villas. Each villa has been named after a tea estate and the overall look and feel is highly reminiscent of world renowned architect, Geoffrey Bawa. Tamba Villas is a delightful private coconut estate which is set back 300 metres from Thalpe beach (on the land side) surrounded by lush tropical gardens and swaying palm trees.There is only a collection of 37 homes, which have been designed by an award-winning Singaporean Architectural team, to create a coastal lifestyle design with high-end amenities for living, working or early retiring in a much sought-after area in the south of Sri Lanka. Since arriving in 2003 from the UK, Hempel has immersed himself in the Sri Lankan property sector, with the goal of building happy and thriving businesses and making a difference in the local community. By working closely with the local culture, he has done just that. Hempel Holdings has a strong foundation in Galle and has grown to be a well-established and grounded business. Over the years, Eduard has been a bridge for people looking to invest in Sri Lanka and he has helped many clients and businesses in the negotiation, acquisition and development of exceptional real estate.Hempel Holdings has a track record of over 15 years in specialised property development. This has been the catalyst in building a good and fair reputation with both Sri Lankans and foreign investors. Hempel is also Co-Director in Pearl Properties in Unawatuna, which has been operating for more than 12 years. 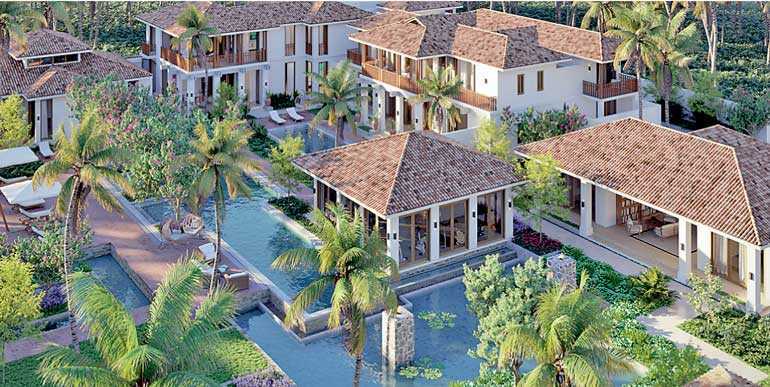 Hempel and Tamba Villas Director and Co-Project Principal Trevor Morgan expect to commence construction of this unique and niche development project in early 2019, while completion of Tamba Villas is estimated to be around late 2020. With a degree in Combined Engineering, from Coventry University in the UK, Trevor founded his first company with a staff of seventeen, covering manufacture, design, administration and fittings. He then went on to gain extensive experience in construction and interiors, working in exclusive areas of Barcelona, which included eight development projects and a £8.6M development project in Kensington, UK. Trevor arrived in Sri Lanka in 2012 to set up Shakticola with Eduard Hempel, bringing his knowledge of managing construction projects from design through to completion, as well as his understanding and experience in achieving a high level of finish for luxury interiors. He has outstanding experience in high end interior and building products. Examples of such products are the Sea Heart House, Koggala Jungle View Villa and Thalpe Villa, to name just a few. Tamba Villas is a collaboration between Shakticola and Award-winning A D Lab, a Singaporean Architectural firm focused on cutting edge residential projects, while STIX, another award-winning landscape designer designed the lush tropical gardens. Together, they have designed generous spaces for tropical living in the form of unique villa homes which coexist in harmony with nature. Singaporean A D Lab is an award-winning firm which has created and completed residential and housing projects throughout Asia and will bring all their experience and knowledge to fashion something unique and edgy to tropical living, while paying tribute to the excellent historical architectural style of Sri Lanka.A D Lab never duplicates developments – instead, they look at each project on its own merit according to the environment and local culture. “The Tamba team wanted to build a development that did not overwhelm the landscape, instead ensuring that each Villa blends in sensitively around all the greenery, preserving the natural surrounding beauty,” said Hempel. Plans are also in place for a Business Centre, a visiting licensed doctor and a visiting beautician, while many other amenities will be added accordingly. Tamba Estates Ltd., a Sri Lankan limited company, owns 100% of the land that Tamba Villas will be built on. The in-house sales team at Tamba Villas office will be handling the sales in conjunction with Pearl Properties, one of the South’s leading agencies. Tamba Villas will also be working with global partners in Singapore, USA, Canada, Australia and the UK, along with one of Britain’s leading digital sales specialists. The core foundation of all of Hempel’s business endeavours is stamped with integrity and professionalism, and Tamba Villas is set to become a valuable asset on the southern coast.